In case you haven’t noticed, there’s a serious debate going on among parents about whether or not vaccinations cause autism. And no wonder, as the numbers keep going up: New statistics from the CDC show that autism now affects a staggering one in 68 kids and jumped more than 400% in 20 years. Everyone wants to know why. And a recent study brings new evidence to support the theory that our environment—not our vaccines—is causing the autism spike. Autism now affects 1 in 68 kids. A recent study brings new evidence to support the theory that our environment—not our vaccines—is causing the autism spike. After the news broke earlier this year that that New York City was experiencing its first measles outbreak in years linked to so-called “anti-vaxxers,” I published an infographic that broke down the numbers associated with vaccines. I shared that in 2011 the Institute of Medicine found no connection between vaccines and autism, and in 2013 the Journal of Pediatrics echoed those findings. After the piece was positioned by a fellow blogger as my “coming out” as pro-vaccine, I took the debate over to my Huffington Post column, where I asked if green was anti-vaccine. I empathized with both sides: All of us simply want to make sure our kids are as healthy as possible. 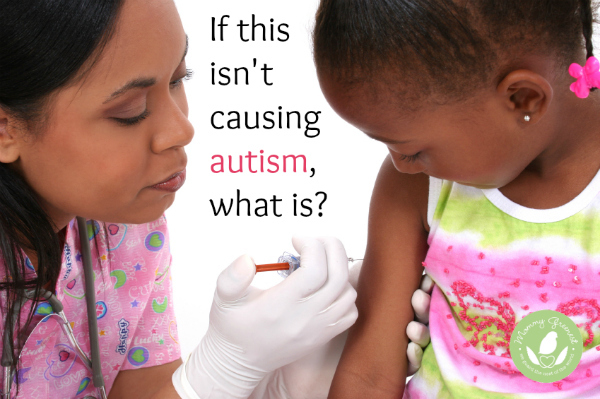 But if vaccinations aren’t causing autism, what is? Many experts believe the problem is in the environment. In 2012, a group of experts identified seven chemicals and heavy metals linked to autism and other neurological problems. Then last year, a study found that women who lived in areas with high levels of diesel particulates and mercury in the air were twice as likely to have a child with autism as those who did not. LEAD in paint. Test your home for lead, and if you suspect high levels, have your family’s blood tested by a doctor. Polychlorinated biphenyls, better known as PCBs, in old buildings with caulk that was installed before 1979. MERCURY in fish. Download the Seafood Watch Pocket Guide or app to find safe, low-mercury (and low-PCB) fish to feed your family. Food heavily treated with PESTICIDES, which can be avoided by eating USDA Certified Organic. AIRBORNE PARTICULATES from car exhaust; avoid idling cars, especially. FLAME RETARDANTS in foam furnishings, pillows and mattresses. BPA in food-can linings, cash register receipts and hard plastics. Use air filters and houseplants to CLEAN YOUR INDOOR AIR. Finally, this is something you should discuss with your pediatrician, but I chose to stagger my youngest daughter’s vaccinations—not because I was concerned about autism, but because I didn’t want to stress her tiny system any more than I had to. I think this is an example of everything the green movement stands for: Questioning preconceptions, seeking out good science, and making better decisions. How about you? and I do realize this article is a little dated but still very relevant. You list all the carcinogens in the environment very eloquently and with sound data to back your article. Upon having very similar conversations with family and friends because I too am concerned for the well being of family members. If we agree and from reading your articles, I think we do. That processed foods and other things that we interact with and consume on a daily basis have very dangerous carcinogens in them for the purpose of Shelve Stabilization and or Cost Effectiveness of which all have been approved by the fd@ ! Do you believe that VACINES are where the line is drawn? Food and other medicines on your list do have carcinogens included for what ever reason. This is excellent. I’m happy to hear.other eco conscience moms are making the educated choice to vaccinate. Thanks Laura! I know this is so controversial right now. I appreciate the vote of confidence!